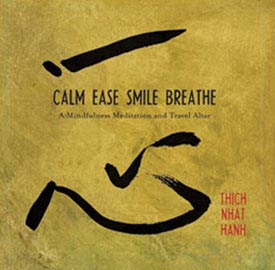 "Calm Ease Smile Breathe" author event Saturday, August 8th! Florey's invites you to come and meet Pescadero-based artist Logan Payne as she discusses her work on the illuminated meditation "Calm Ease Smile Breathe". About the book: This illuminated meditation highlights a key mindfulness practice for cultivating serenity in the here and now. Presented in a beautiful and uniquely usable way the gift set includes a travel size altar with a guided meditation; a CD with Thich Nhat Hanh's step-by-step instruction; and a booklet with biographical information about the author and artist as well as background on mindfulness practice. 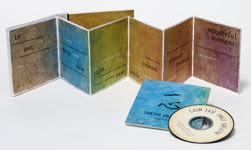 Calm Ease Smile Breathe helps you create your own sacred space wherever you need it most. The results can lead to letting go of our worries and experiencing more deeply the life around us and our own aliveness in the present moment. Logan Payne created the background art from her "Patina Series" of oils on paper, and the illustrations are brush and ink. pursue painting, graphic design, and illustration.